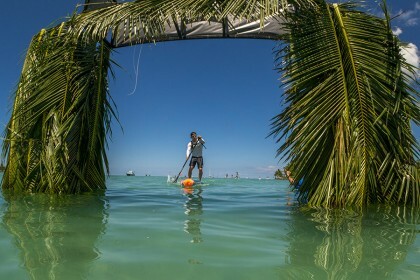 The action at the 2016 Fiji ISA World SUP and Paddleboard Championship kicked off on Sunday, with SUP Surfing delivering a strong start to the week of competition. 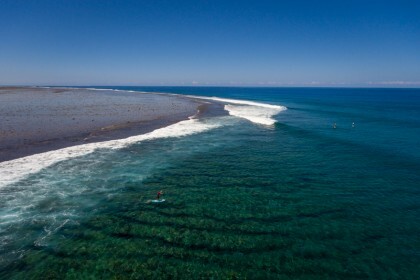 The world’s best men and women SUP surfers took to the water and showcased their talent in the famous wave of Cloudbreak, a shallow and powerful reef located in the open ocean off the Fijian island of Viti Levu. Rounds 1 and 2 of the Men and Women Main Event were completed with surf at Cloudbreak ranging from chest to head high, providing open faces and occasional barrels for the competitors to post solid scores. In an explosive Men’s Main Event Round 2 heat, France’s Benoit Carpentier and USA’s Giorgio Gomez scored the third and fourth highest heat totals of the day with 16.44 and 15.97 points, respectively. Carpentier and Gomez advanced onto Round 3 of the Main Event, sending Puerto Rico’s Omelv Garcia (5.9) and Spain’s Oscar Ruiz (5.9) into the Repechage Rounds. 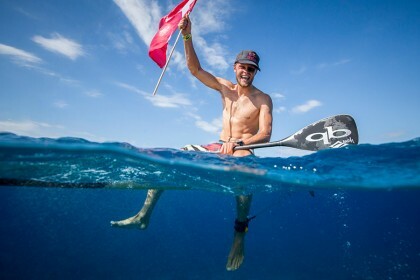 “It feels amazing to represent my country out at Cloudbreak. It’s my dream to be out here with surfing with only a few guys. I am so happy to make it through the second round and advance in the competition”. Topping off the day of the Men’s Main Event, Hawaii’s Mo Freitas earned the day’s highest single wave total of 9.7, linking together solid cracks on a long, running left, while Tahiti’s Poenaiki Raioha, the 2014 SUP Surfing Gold Medalist, earned the highest heat total of the day with 17.03. On the women’s side of the action, USA’s Izzi Gomez, the reigning Women’s SUP Surfing Gold Medalist, competed in the first women heat of the day and showed the international field of competitors that she intends to make a run at repeating her 2015 Gold Medal performance. Gomez put together a heat total of 13.67, which was the second highest women’s total of the day. Australia’s Shakira Westdorp notched the highest women’s heat total in Round 1 with 14.17 points, but fell to Repechage in Round 2. The Cook Island’s Charlotte Piho found herself in a slow heat in Round 1 and was unable to find waves with scoring potential, resulting in her relegation to the Repechage Rounds. Despite a rough heat, Piho spoke about the development of Surfing and SUP in the Cook Islands, which joined the ISA as the 99th member in 2016. “To be the first athlete to represent the Cook Islands in an ISA World Championship is truly a huge honor. I hope this encourages other Cook Islanders to represent our country at an international level”. 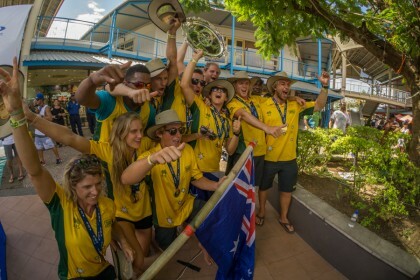 “Being a member of the ISA will hugely help the development of SUP and Surfing in the Cook Islands through competing in ISA World Championships and initiatives such as their scholarship program. This gives kids something to train for and look forward to, providing them with opportunities that they otherwise wouldn’t have”. 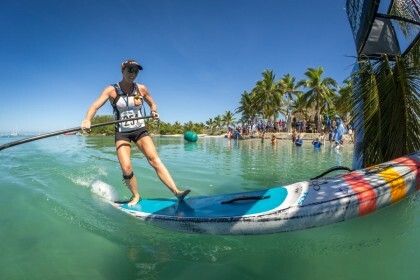 “The global growth of SUP is more evident than ever at this edition of the event, as it features competitors from countries that have never competed in the ISA before such as Slovenia, the Cook Islands and India”. Regardless of the first day’s results, nobody has been eliminated. All the athletes placing 1st and 2nd move on to the next round, while all athletes that placed 3rd and 4th moved on to the Repechage Rounds, where they will get a second chance to redeem themselves.